Our core values get us up in the morning, infuse everything we do, determine who we attract and who we hire, and inform all our programming decisions. We couldn't help but share! Our community is us and we are our community. We recognize that we will be the best organization when we are working with and pulling together diverse groups of people from across our community. We value diversity in every form. 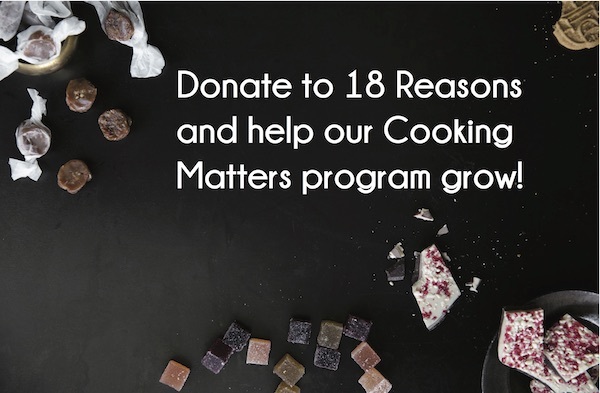 Everyone feels comfortable and welcome at the 18 Reasons space, in Cooking Matters classes, and at any 18 Reasons event. We are accountable for our own actions and hold each other accountable. We take an active role in our community’s empowerment. We believe in the transformative power of food. We love good food and think that every person has a right to eat well. We value home cooking and the home cook. We believe that food is at the heart of community and is so much more enjoyable when shared with others. Good food is more than just delicious – it nourishes our body, improves our quality of life and the lives of the people who grow and produce it, and is better for the planet. We are all teachers and learners at 18 Reasons. We thrive on creativity and strive for constant improvement – both as an organization and within our programming. We are always seeking new ideas and better ways to solve problems. We love to share our ideas and listen to our partners share theirs. Our teaching is dynamic, informative, and passionate in both Cooking Matters classes and in the 18th Street classroom. We craft a curriculum that feeds students’ creativity and allows them to personalize their journey and find inspiration for a lifetime of cooking and eating. We love what we do and who we do it for. We are passionate about what we do and committed to making a difference. The students and community members we work with energize and fulfill us. We care for and serve each other and our wider community with love. We strive to deepen our relationships and build trust with the people we serve.